NOTE: Date must be in the form YYYY-MM-DD, like 2019-04-10. The No. 6-ranked Lindsey Wilson softball (31-1) team swept a pair of out of conference games against Ohio Christian (14-24) on Wednesday afternoon at Marilyn D. Sparks Park. Blue Raiders took game one 11-0 in five innings, after outhitting the Trailblazers 14-3. Lindsey Wilson carried their offensive prowess into game two to defeat Ohio Christian 13-0, connecting for 19 hits compared to OCU's one. Lindsey Wilson returns to conference play this weekend as they take on Mid-South Conference opponent Shawnee State (Ohio) on Friday and Saturday from Marilyn D. Sparks Park, Lindsey Wilson Sports Complex, 928 Russell Road, Columbia, KY.
2019-04-10 - Columbia, KY - Photo by Tiffany Kessler. Adair County Judge Executive Gale Cowan signed a proclamation which put our local 911 Center in the spotlight. April 14-20 is designated as National Public Safety Telecommunications Week. Pictured L to R, front row: Magistrate Harold Burton, Judge Executive Gale Cowan, and Magistrate Greg Caldwell. 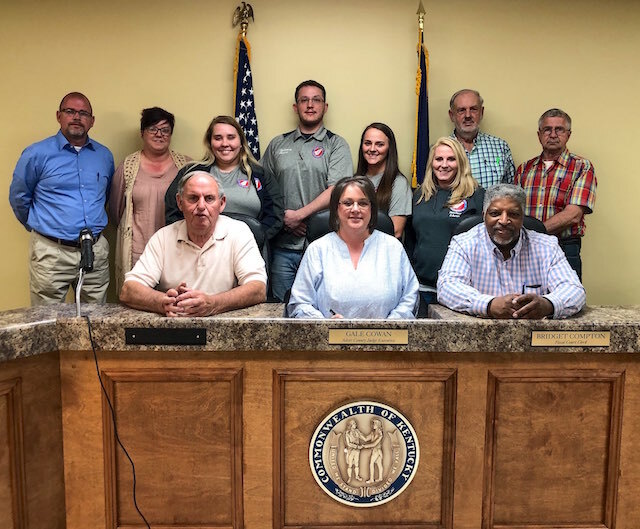 Back row, L to R is: Magistrate Daryl Flatt, Ashely Feese (Part Time), Chryslee Sherrill (Part Time), 911 Center Director Jason Upchurch, Nicole Bradshaw (Certified Training Officer), Danna Burton (Deputy Director), Magistrate Billy Coffey, and Magistrate Terry Hadley. Monday, April 15, 2019, will be the last day to pay your 2018 County Property taxes in the Sheriff's Office. The office is open from 8amCT until 4pmCT, and is located at 424 Public Square, Columbia, Kentucky. Michael Hansford Penick of Greensburg, KY, son of Charles Penick of Greensburg and Linda Sue Hudgins Shofner of Summersville, was born on Wednesday, January 18, 1961 in Adair County, Kentucky and departed this life on Sunday, April 7, 2019 at his home. He was 58 years, 2 months, and 20 days of age. The funeral services will be conducted at 11amCT Thursday, April 11, 2019 at the Cowherd and Parrott Funeral Home with burial to follow in the Bethlehem Cemetery. Bro. Jerry Judd and Bro. Leslie Jewell officiating. Visitation after 7am Thursday until time of the funeral service. Pallbearers are: Josh Evans, Tony Evans, Jay Davis, Caleb Richerson, Bruce McCandless, Scott Estes, and Neal Huffman. Gladys Mae Coe, 88, of Russell Springs, died Monday, April 8, 2019 in Jamestown. Funeral services will be 10amCT Friday, April 12, 2019 at the Bernard Funeral Home Chapel with Bro. Randy Brown officiating. Visitation will be 5-8pm Thursday and after 8am Friday until funeral time at 10. Interment in the Ridgecrest Cemetery. Earlene Robertson, 88, of Russell Springs, died Monday, April 8, 2019 at the Lake Cumberland Regional Hospital in Somerset. Funeral service for Earlene Robertson will be 11amCT Thursday, April 11, 2019 at the New Victory Baptist Church with Bro. Mike Denny officiating. Visitation 5-8 Wednesday, Bernard Funeral Home Chapel and after 9am at the church. Special music: Erica Burton, Chloe Burton, and Kolton Grider. Pallbearers: David Neat, Brian Carter, Jeff Robertson, Jason Boodrum, Doug Holmes, and Neal Bell. Come Join Us for a Build a Book Party Tuesday, April 16, 2019 from 5-6pmCT at the Adair County Primary Center Cafeteria. Create a book with your child that your family will always treasure. We hope you will join us and share in this special event to build your child's love for books! Sponsored by: ACPC Title I, Family Resource Center & 21st CCLC-Camp Casey with Assistance from: Mrs. Arnold and the LWC Children's Literature Class. Remember, stop and verify before giving any information at any time! These scammers try to steal the victim's insurance and personal information in order to receive reimbursement for services or medical devices that were not provided or medically necessary. FRANKFORT, Ky. (April 9, 2019) - Following reports from Kentuckians, Attorney General Andy Beshear has issued a scam alert to warn of medical billing scams targeting families. Campbellsville, KY - "People here want me to succeed. They want me to grow as a student, musician and educator," Cassidy Allgood, a senior of Louisville, Ky., said to attendees of Campbellsville University Women's Alliance Brunch on Friday, April 5, 2019 in Winters Dining Hall. Allgood was one of two students from the School of Music who spoke at the event. The Women's Alliance was started to build a bridge between campus and the community, and one of the biggest items the alliance focuses on is the student emergency fund. Debbie Carter, an Assistant Professor of Social Work, said the "emergency fund is to help students who have a crisis." The money can be used for a range of reasons including travel expenses for a student to get home for an emergency or for parents to come to Campbellsville. I thought CM readers might enjoy this article about William Wright (aka Dan de Quille), one of Mark Twain's early mentors. The article notes that Mr. Wright was a native of Knox County but doesn't mention the state. It was Knox County, Ohio. KnoxPages.com: This Knox County native launched Mark Twain. On Friday, April 5, 2019, The Adair County Sheriff's Office responded to a residence off Hutchison Loy Road to investigate a complaint they had received about activities taking place at the residence. Upon deputy's arrival, methamphetamine was located at residence as well as an indoor marijuana growing operation. One of the owners of the property, David Scotty Corbin, 39, was not present, but deputies were able to locate him a short time later in the limits of Columbia. A traffic stop was attempted to take him into custody. Corbin fled, leading the Sheriff's Office, Columbia City Police and Kentucky State Police into a pursuit that ended in the south end of the county around the Chance community. Corbin went off road onto old ATV trails in his 4x4, forcing officers to discontinue pursuit. Around midnight on Friday, information was received that Corbin was setting on an old trail off of an area known as Tater Cave. Sheriff Brockman and several deputies, multiple troopers, and Kentucky Fish and Wildlife Officers hiked into the area on foot, making contact with Corbin about a mile into the trail. Corbin was able to get to his vehicle and elude officers once again, heading out the other end of the trail. Warrants of arrest were obtained by the Sheriff's Office, and on Tuesday, April 9, 2019, at around NoonCT, deputy Josh Durbin was able to get a location on Corbin and a vehicle description. His location was broadcast, and CPD Officer Adam Cravens and Sgt. Murphy were able to stop Corbin on the Veterans Memorial Bypass and place him in custody. Toddler Bella Streeval and family continue to battle her severe seizures, and battle for her life. A fundraiser is being started by friends and neighbors in hopes of gathering support to help them with expenses. Her story is below and ways to contribute are suggested for any who feel called to help. Two-year-old Bella has the most beautiful, long, brown hair. When down and sweetly flowing it is a mix of little girl curls and ringlets. So thick and full in fact, one would never see the cochlear implant on each ear unless already aware of them. But the implants for this child are only a small piece to a much bigger story. Kelleyville Community Church will have an Easter play on Good Friday, April 19, 2019, at 6pmCT/7pmET at the church shelter. Light refreshments will be served. The church is located at 77 Kellyville Rd, Columbia, KY.
Frankfort, KY - On Tuesday, April 9, Gov. Matt Bevin vetoed House Bill 358, which the General Assembly passed on the final day of the 2019 legislative session in an attempt to provide pension relief for Kentucky's quasi-governmental entities. The Governor plans to call a special session to address the solvency of these entities, such as health departments and mental health boards. The No. 8-ranked Lindsey Wilson softball took both games against Cumberland (TN) at Sparks Park Tuesday afternoon. Lindsey Wilson (29-1, 12-0 MSC) out-hit the Phoenix 15-5 over the two games, while only allowing two runs by Cumberland. Callum Pilgrim captured the all-time stolen base record in Lindsey Wilson softball program history in the bottom of the sixth inning with 92 career stolen bases. Makea-Al Kaluau led the offensive efforts batting 5-of-6 with three RBIs on the day. Pilgrim went 2-of-3 in game one with two home runs and three RBIs. Lindsey Wilson softball team is back in action Wednesday against Ohio Christian at 1pmCT at Marilyn D. Sparks Park, Lindsey Wilson Sports Complex, 928 Russell Road, Columbia, KY. He was a World War II and Korean Conflict Navy Veteran and a businessman and accountant. He was president of the Chamber of Commerce in 1968 and worked diligently that year to establish the Taylor County Hospital district to assure Taylor County would continue to have a hospital after the nuns stopped running Rosary Hospital. He was elected Citizen of the Year in 1968. Expressions of sympathy are requested to be donations to food for the poor. Mark B. Chandler of Campbellsville, KY died Sunday, April 7, 2019 at age 92. Funeral mass will be held at 10amCT/11amET Friday, April 12, 2019 at Our Lady of Perpetual Help Catholic Church in Campbellsville by Rev. Fr. Sadu Vadakumpadan. The Adair County Board of Elections will conduct Absentee Voting from Friday, May 3, 2019 until Monday May 20, 2019 during normal business hours, Monday-Friday from 8amCT to 4pmCT, and on Saturdays from 8amCT to NoonCT. Voting location will be in the Adair County Clerk's Office, 424 Public Square, Ste3, Columbia KY 42728. If you have any questions please contact the Clerk's Office at 270-384-2801. It's currently 46F at the Adair County Mesonet station. Look for sunny skies today, with a high near 76F. Calm wind becoming southeast around 6 mph in the morning. Tonight will be partly cloudy, with an overnight low around 56F, and east wind 5 to 8 mph. Thursday will be mostly sunny, with a high near 80F. South wind 11 to 20 mph, with gusts as high as 31 mph. Showers are likely Thursday night, and possibly a thunderstorm, mainly after 4amCT. Mostly cloudy, with a low around 59F and south wind around 17 mph, gusting as high as 28 mph. The chance of precipitation is 70%, with new rainfall amounts between a tenth and quarter of an inch possible. --Robert Stone, Wednesday, 10 April 2019. Adair County: No events Circuit Court. 1 event District Court. Cumberland County: No events Circuit Court. 100 events District Court. Green County: 93 events Circuit Court. 3 events District Court. Metcalfe County: No events Circuit Court. 56 events District Court. Taylor County: No events Circuit Court. 118 events District Court.